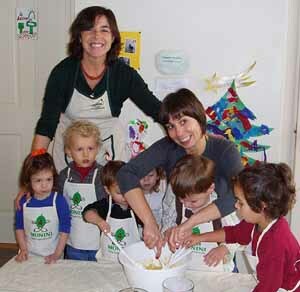 The children at "La Piccola Scuola Italiana" in San Francisco, CA, start to learn how healthy it is to cook with Extra Virgin Olive Oil! La Piccola Scuola Italiana is the only Italian-language preschool in San Francisco and it is a non-profit organization (501c3). This month La Piccola Scuola is seeking donations for a Cocktail Party and Silent Auction, which willl be held on Feb 4, 2005 to correspond with Carnevale. The mission of this school is two-fold: (1) to provide the highest quality, progressive early childhood care and education for children ages 6 months to 5 years, and (2) to build a community in which children experience lively Italian language and authentic Italian culture. Taught by native Italian speakers, the program has already earned support and recognition from the Consul General of Italy, the National Italian American Foundation, Panorama Italiano di San Francisco, and the Bay Area Italian and Italian-American community. The Silent Auction will be the centerpiece of La Piccola Scuola Italiana’s fundraising efforts this year. Monini has donated a beautiful hand made and hand painted plates from Deruta and filled up whit a selection of our Extra Virgin Olive Oils. To learn more about LA Piccola Scuola Italiana please click here.